The Midwest has a diverse selection of camping areas surrounding the Great Lakes, as well as other parks with rivers, plains, hills, valleys, and waterfalls. You’ll find opportunities whether you're looking for modern amenities or a place to pitch a tent and rough it. Let’s look at some of the best places to visit and explore in the Midwest where pitching a tent solo or with the family is sure to build memories that last a lifetime. This 244,000-acre park contains one of the richest fossil beds in the world. It also has plenty of animals roaming the plains, from prairie dogs to bison. The park has two campgrounds, including a backcountry site, which ​are both open year-round. This park offers beautiful views of the forests and marshland and has nearly seven miles of Lake Michigan shoreline. You’ll also find dunes and a must-see lighthouse. Hikers will love its eight trails that cover 18 miles. You won’t run out of nature’s beauty while camping here. The park is filled with natural wonders, such as a sandstone bridge, gorges, sandy beaches and an incredible lake for boating and fishing. Hikers and mountain bikers should check out the park's more than 29 miles of trails. The dunes, hills, valleys, and lakes at Sleeping Bear can be traced back to the Ice Age. Activities include a dune climb, scenic drives, a maritime museum, canoeing, campfire programs ​and ranger-led tours. This shoreline is one of the best places in the Midwest to set up a tent. This park has it all, from caves and bridges to waterfalls and gorges. Camping options are many. You can sleep at horse ranches, in a wigwam, by the river, at an RV park or a private primitive site. There are also cabins and a modern retreat center. In addition to some of the best beaches in the Midwest—on 15 miles of shoreline—this park has more than 70 miles of trails through prairies, forests, and dunes. Activities include swimming, fishing, and kite flying. If you enjoy birding, you're in luck—the area has a vast diversity of birds traveling south for the winter. This is the only national park in Minnesota, and it’s located on the border of the United States and Canada. Four museum lakes give way to 344 square miles for water sports. Other activities include guided boat tours, ranger-led programs, canoeing, kayaking, hiking, and swimming. Indiana’s largest state park has plenty of rolling hills and waterfront for biking, hiking, swimming, and fishing. There’s also a large indoor aquatic center featuring a water slide. This Midwest state park is a camping spot with a family-friendly aquatic center, a lodge, and restaurant. The park also has a nature center. Activities include golf, mini-golf, paddle boating, fishing, hiking, biking and horseback riding. Enjoy the quiet along the sandstone cliffs as you overlook Sugar Creek and hike to the Pine Hills Nature Preserve at this spring and summer camping destination. You can hike, canoe and bicycle. This is also an excellent area for bird watching. This area has some of the best camping in the Midwest. Just outside the 468 campsites at this Door County park are a golf course, beach, lighthouse, bike trails and high bluffs that are part of the Niagara Escarpment. If you like watersports, try canoeing, kayaking, fishing or boating. There's also the Northern Sky Theater that family-friendly musical comedies. Scenic views are everywhere at this campground inside one of the country’s great parks, which is filled with rock formations, green meadows, brooks, vistas—and a lot of buffalo. Go trout fishing, horseback riding or hiking among the pine trees. Put this wonderful place to camp on your list if you're visiting the Midwest. Between the Silver Dollar City amusement park and popular Table Rock Lake, you can find scenic campgrounds, rustic cabins, and RV sites. Amenities include a free shuttle to Silver Dollar City, a swimming pool, a game room and general store. Although bird and animal watchers love this Midwest park, the real attraction is the trees. You’ll find sassafras, maple, oak, hickory and walnut around the 59-acre Walnut Point Lake and hiking trails. There's also geocaching, fishing, and hiking. 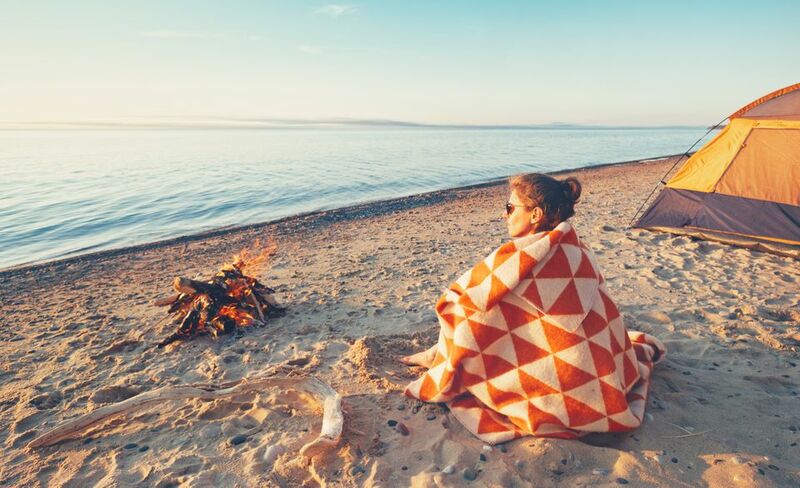 Named one of the top five destinations in all Minnesota by Lake Superior Magazine, Grand Marais Recreation Area’s campground is situated between the harbor on one side and the gorgeous Lake Superior on the other. With a softball field, a variety of campsites for all travelers, and a lakeside pavilion, there’s something for everyone at Grand Marais. Wilderness State Park straddles the western border of Lake Michigan, with two beautiful islands smack dab in the middle to visit by kayak or paddleboard. This is a picturesque representation of the Great Lakes region and everything you’ll find when traveling through it. Lighthouses are scattered along the lakeshore, where you’ll find otter, muskrats, and mink, and other animals roaming around. This state-owned recreation area covers more than 8500 acres in Reynolds County. It also offers access to the adjoining Francois Mountains and Taum Sauk Mountain State Park in the heart of the Ozarks. The river cascades through the area, creating beautiful landscapes to hike, kayak, and picnic at you won’t find elsewhere in the region. Starved Rock State Park is one of the most popular in Illinois since it opened in the early 1900s. With premium RV and campsites, a full-service bathhouse, and large open grassy areas that house community picnics, there’s something for everyone at this park. Fishing, hiking, and boating are available for travelers inside the 18 canyons that comprise Starved Rock. Sibley State Park is located on the shores of Lake Andrew. The Civilian Conservation Corps constructed a handful of rustic style stone structures throughout the park. It’s now listed as a National Register of Historic Places, protecting those structures for future visitors. Treasure hunters are rumored to love this area as hidden caches, and other items are buried throughout the park to find. The grassy prairies of eastern Kansas let anyone get away from it all, catch their breath, and relax without their daily worries. Council Grove Lake sits center in Tuttle Creek Cover Park, giving travelers the opportunity to boat, kayak, and hike around the surrounding areas framed by the dam making it possible in the background. Watersports, picnicking, and hunting is abundant in the surrounding areas. The history surrounding President Abraham Lincoln can be found in this state park bearing his name. With tours of reconstructed buildings and points of interest, history buffs will find the area ripe with Native American tales while those who enjoy hiking and biking will find trails aplenty. The Heart River lies in the background with natural, historical trails to follow through the nearby areas. The Des Moines River Valley is home to the sprawling Dolliver Memorial State Park. With more than 500+ acres of bluffs, flatlands, Native American mounds. It’s an explorer’s paradise. Hiking through the well-maintained historical trails are a once in a lifetime experience. If hiking isn’t your thing, bird and animal watching is plentiful right from your campsite.